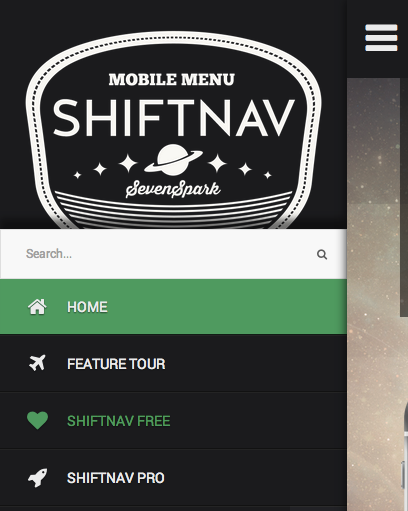 ShiftNav is an off-canvas mobile menu plugin that you can use in place of UberMenu on mobile sites if you prefer this type of menu. ShiftNav is built to work with UberMenu (just use the checkbox to hide UberMenu in the ShiftNav settings – or a specific UberMenu ID if you have multiple instances). ShiftNav is an independent menu system from UberMenu, with its own settings tailored to mobile users. It won’t inherit UberMenu features such as images, widgets, custom content, etc. It also will not process advanced UberMenu items such as dynamic posts, tabs, etc. This is normally not an issue – the purpose of ShiftNav is to provide a streamlined menu designed specifically for mobile users. So while it is possible to apply the same menu to both UberMenu and ShiftNav, you would normally maintain two menus – one for desktop users and one for mobile users.